Rice Crispy Treats are a classic. There’s something about the smell of melted butter and marshmallows that defines the word….. yummy. Why not turn them into a delicious seasonal dessert? Finding supplies to decorate the snowmen turned into a bit of a treasure hunt in my house. My kids sacrificed some of their leftover Halloween candy, and I discovered some licorice deep in our pantry. The only thing more fun then decorating them was eating them eyeballs and all! Prepare a pan or baking sheet with wax paper, place to the side. Melt butter in a large saucepan on medium heat. Add marshmallows and stir with a spatula until marshmallows are dissolved. Slowly stir in Rice Crispies. Turn off heat. Allow mixture to cool for 7 to 10 minutes. 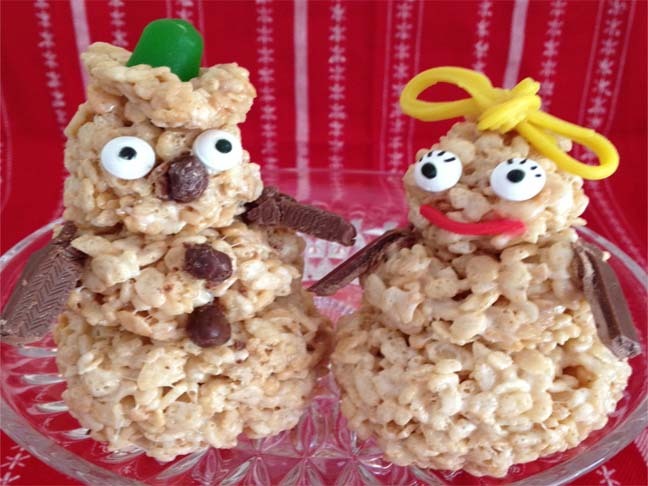 Butter your hands and get ready to make some snowmen. Be very careful when touching rice crispy mixture it may be hot. Ideally it’s cool enough to touch but not so cool that it’s hardened. Using your spatula, scoop approximately ¼ cup mixture and form into a ball. Place the formed ball on your baking sheet. Repeat the process with a smaller amount adding layers to your snowmen. When your snowmen are complete it’s fun to get the kids involved in decorating. I used candy eyeballs, Snickers, licorice, and Raisinets to decorate mine. If you’re having a hard time getting the decorations to stick, make up a tiny batch of icing to help the candy adhere. I used 1/2 cup of powdered sugar and 1 tablespoon water or milk and it worked marvelously. Enjoy!